Over one hundred railroad historians from all over the country met at the Glendale yard of New York & Atlantic Railway on Saturday, June 17. 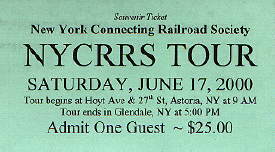 The occasion was the annual meeting of the New York Connecting Railroad Society. 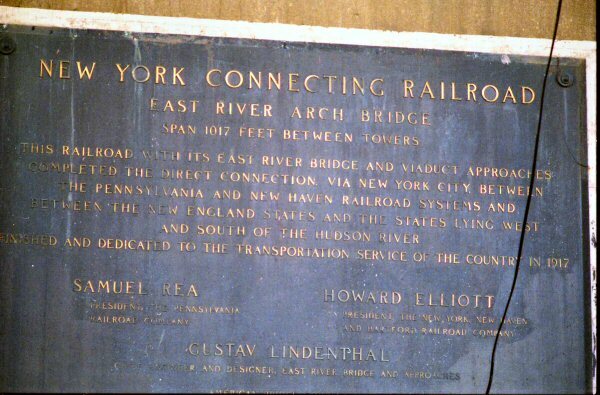 The main interest of this group is the rail route, built in 1917, which crosses over the Hell Gate Bridge from the Bronx to Queens. 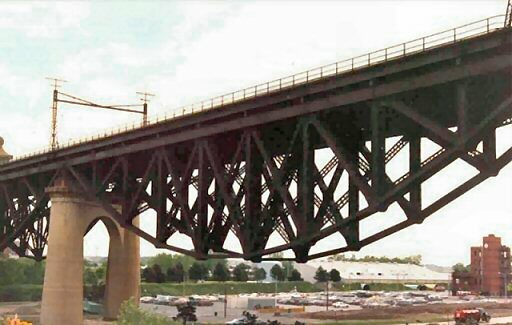 The tracks soar over Astoria on a high viaduct, and then continue through Woodside, Maspeth, and Middle Village using a series of smaller bridges and tunnels. The main junction is in Glendale at the rail yard on Otto Road. The tracks then travel into Brooklyn and eventually end at the waterfront in Bay Ridge, near 65th Street. This rail route is used by many freight trains each day. It passes through one of the most densely populated urban areas in the world, and yet trains go virtually unnoticed. This is because the route was thoughtfully constructed without any grade crossings to delay traffic. Saturday and the New York Connecting Railroad (NYCRR) Fan Trip over the New York & Atlantic had arrived. And a HOT one it was; with temperatures hovering in the mid to high 90's. Seems the weatherman had saved his best NY City "dog days" three "H" special combination; hot, humid, and hazy, for us. 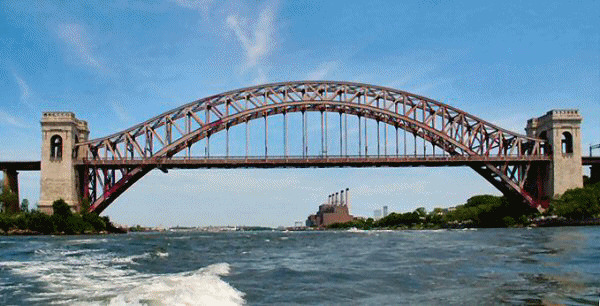 10:00am: Our first stop (via car) was at the foot of the famous Hell Gate Bridge, sometimes referred to as the East River Arch Bridge, in Astoria, Queens, NY. Located both in New York (Ward's island) and Queens Counties (Astoria Park), it is considered to be one of the world's most beautiful bridges. 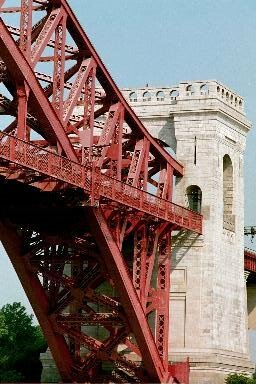 The crowning achievement of late 19th century bridge designer Gustav Lindenthal, the span also was the world's heaviest and longest steel arch bridge, at that time, when completed in 1917. 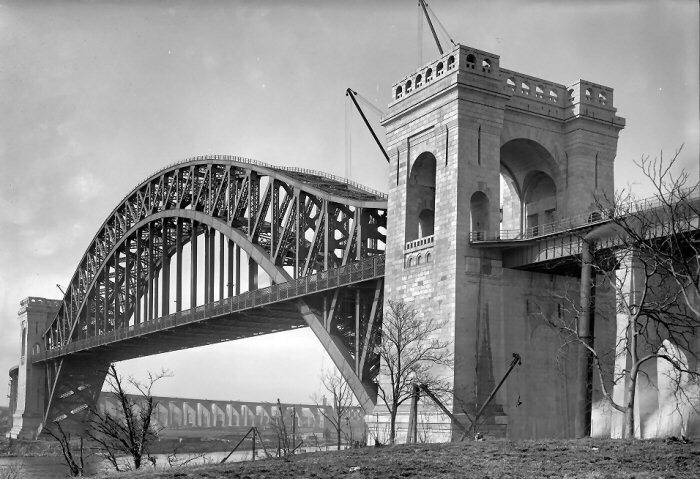 Hell Gate Bridge was the main element of the New York Connecting Railroad's (NYCRR) project that linked the Pennsylvania Railroad and the New York, New Haven and Hartford Railroad, allowing a direct route to New England. The bridge was constructed over Hell Gate, a narrow channel so named because of its turbulence. The waterway is 100 ft deep at midstream, with a tidal rise and fall of 6 ft and a high tidal velocity. The 1,017-ft arch bridge is a two-hinged steel arch with a clear span from center to center of 977.6 ft. 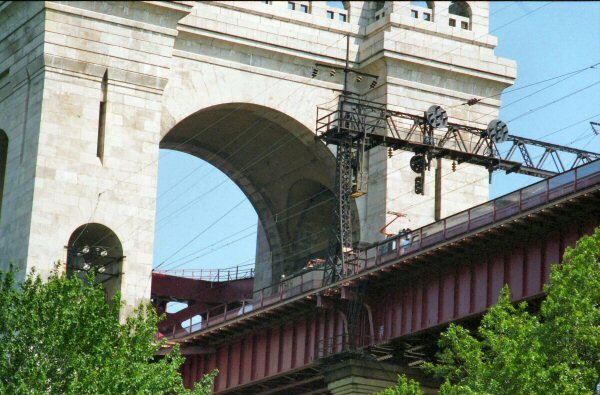 Built to accommodate four railroad tracks, the height of the pylon towers are 250ft, the suspended deck height is 135ft, and the height of the arch is 305 ft.
Gustav Lindenthal's plan was to provide for additional suspended decks above the tracks for automobiles, subway lines, and trolleys. The PRR, of course, never utilized this capability. Therefore, we have quite a large portal opening above the existing track deck level. The entire weight of the bridge rests on the base of the arch, thus all the concrete block tower structure above is aesthetic in value. The choice of the smooth decorative block is said to have been chosen to prevent patients from the nearby Ward's Island Manhattan State Hospital (see map) from scaling the towers. 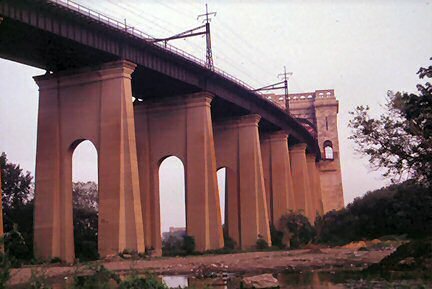 Leading up to the towers are a series of viaducts, in and of themselves an imposing engineering feat. 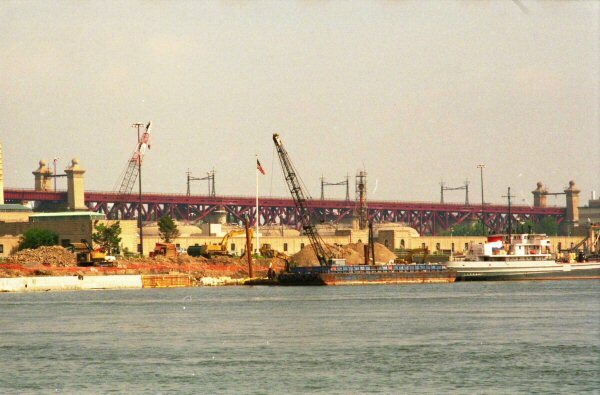 Separating Ward's/Randall's Islands from the Bronx mainland is the Bronx Kill; all spanned by The Little Hell Gate series of deck truss bridges.